I’ve been resisting the pull to do holiday stuff not because I consider myself to be a Grinch but because most holiday treats are pricey and the kitsch surrounding things like Christmas stuff, often elaborately presented with excessive icing sugar and plastic looking holly sprigs makes me want to gag. I love the holidays, I just don’t like them shoved down my throat before I’m ready. I believe the best holidays are the ones that reflect the people you love to celebrate with and that contrary to every store display, less is more. This is the one holiday that you get a free pass to eat the greasiest food imaginable. The reason for this is because there was only enough oil for this lamp to burn for one day of celebrations after the Israelites won the war against the Syrians yet due to a miracle it burned for 8 days instead. We therefore celebrate by eating all things oily. 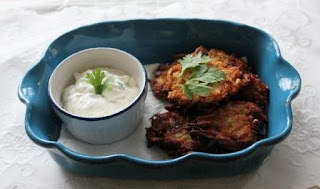 This potato latke recipe is my take on my great grandmothers’. It uses the traditional potatoes, onions, and eggs, but I add apples for extra sweetness. You can have these over the holidays as a snack or side dish or as a tasty alternative to hash browns at breakfast. They’re great as is or with a nice dollop of sour cream or apple sauce. If you want to jazz up the sour cream, add half a teaspoon of salt, 1 clove of grated garlic and 2 tablespoons of your favorite chopped fresh herb (dill, cilantro, or mint are great) to half a cup of sour cream. I like yellow fleshed potatoes, also known as Yukon Gold, because they’re the perfect balance of starchy and waxy and are therefore all purpose, but you could also use russet or white fleshed potatoes as they fry up well. If you have any doubts and the taters come prepackaged, check the bag. The producer will indicate if they’re good for frying. Peanut, Vegetable, Canola, Grapeseed and Corn Oil are all good choices as they can withstand high heat. DO NOT USE BUTTER OR OLIVE OIL AS THEIR LOW SMOKING POINTS WILL GUARANTEE A FIRE. Remember this and fry fry away! Something at least an inch and a half deep so it will hold the oil. Grate the potatoes, onions, eggs, and apples into a bowl. Crack in the eggs and add the baking powder and flour. Mix everything with a wooden spoon. Put the pan on the stove, add the oil, and turn the heat on high. Wait a minute or three and then stick the handle of your wooden spoon into the oil. If tiny bubbles form around it, you can now start frying. Scoop 1 heaping tablespoon of your latke batter into the oil and then flatten it with your spatula. Repeat at least twice depending on the size of your pan. You want to make sure there’s at least half an inch of space between them so you can flip them easily. The oil will splatter a bit while you’re frying, but that’s normal, just be sure to keep a safe distance from the pan. If you’re really scared and have safety goggles and this is your first time frying anything, feel free to put them on. Once the edges of the latkes are brown, flip them over and cook for another minute before transferring them to a plate lined with paper towels or a clean dish towel. The towel will absorb any excess oil. Repeat until you’re all out of batter. If the oil starts to smoke, turn off your stove for a minute or 3 but continue frying your latkes. Oil can hold high heat for a little while so you won’t jeopardize your latkes by giving the pan a break. Once you feel safe again, you can turn the heat back on. Once the latkes are done, turn off the heat but DO NOT IMMEDIATELY RINSE YOUR FRYING PAN. This is the way many kitchen fires start. Leave the pan on the stove (you can cover it if you wish to prevent any bugs from getting in there) until the leftover oil is room temperature or cool and then pour it into an air tight container. You can reuse this oil for cooking or frying at least twice before tossing it, though sadly there’s no strict rule about how many times you can. When in doubt, use your common sense and smell it. If it smells gross, don’t use it and Google community organizations that will dispose of your used oil safely – they exist. Now forget about the oil and enjoy your latkes! And stay tuned for next week when I’ll show you a new Chanukah tradition: Deep Fried Chocolate Wontons!